The temperate rainforest teems with energy and life. The world’s largest spruce stands by Lake Quinault at the edge of Olympic National Park. The “tree of life” somehow survives on the Washington coast despite its exposed roots. Another of the Olympic National Park’s giants. Forks, Wash. –The Duncan Cedar is about 15 miles off the highway, most of it dirt roads. A sign reading “Big Cedar Tree” marks the turnoff from Rte. 101, but the signs are sketchy once you’re in the woods -- “Big Tree” with an arrow, painted on a stump – and easy to miss. Once you find it, there’s no mistaking what’s considered the largest western red cedar in the world. Duncan, named for the loggers who discovered it, towers over the large trees that surround it. The tree is 1,000 years old, and it seems its best days are long past. There aren’t many needles on Ol’ Duncan, just a few, clinging to branches near the very top, not nearly enough to support a tree that size. But she is staying alive, with a little help from her friends. 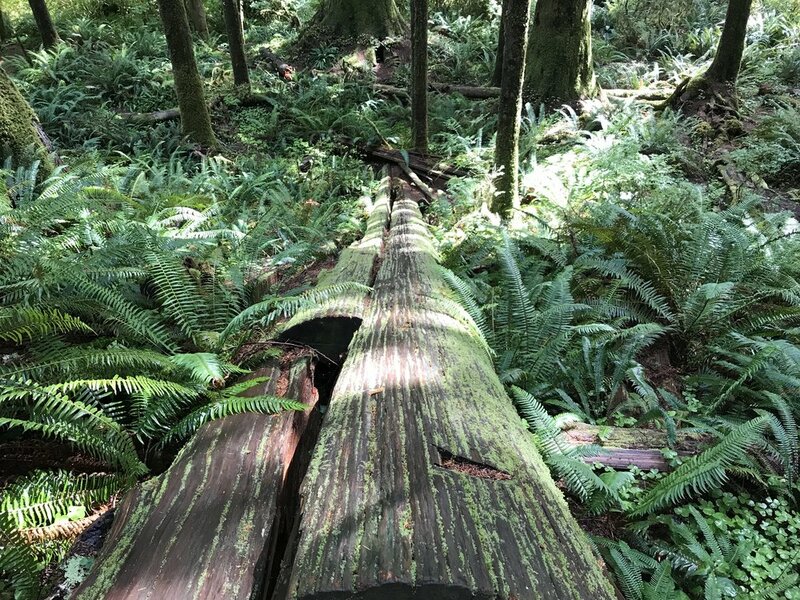 The old growth forest in and around Olympic National Park is home to thousands of remarkable trees and several record-holders. The world’s largest spruce tree, 191 feet tall, is a short walk from the road. Other giants require a 10- or 20-mile hike are accessible to those willing to hike 10 or 20 miles, while the exact location of others is known only to scientists and park officials. 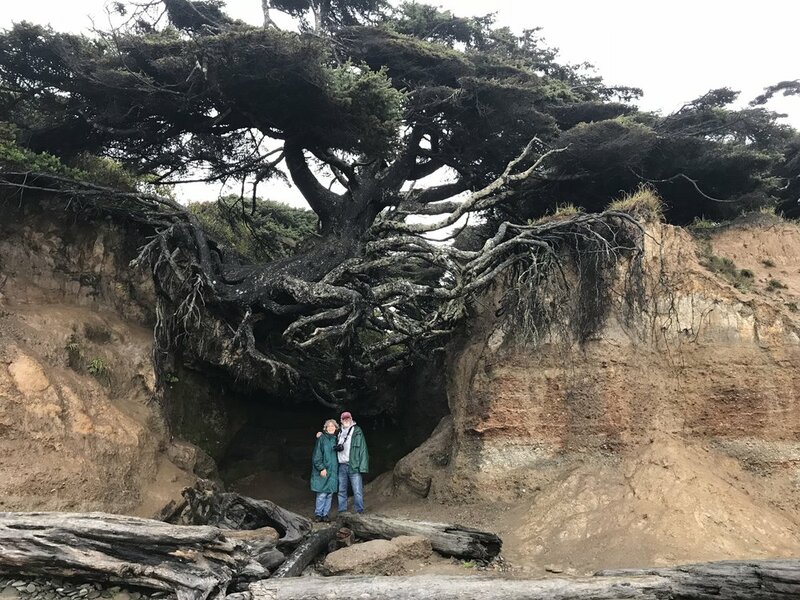 On the beach near Kalaloch, the “tree of life,” suspended improbably over a cave, its roots swaying in the Pacific winds, entertains a steady stream of visitors. Visitors shouldn’t miss the forest for the individual trees, impressive as they are. The temperate rainforest is lush, moist and every shade of green. It teems with life, buzzes with energy – and that’s just above the surface. A new school of forestry science argues that the real action is below the surface, where the roots of the trees are communicating with each other, sharing nutrients, raising tree children, sustaining a forest community. If that sounds like we’re going overboard in assigning human qualities to plants, I hear you. But that’s the kind of language foresters like Peter Wohlleben and Suzanne Simard use to describe what they’ve learned about trees. Wohlleben wrote the bestseller “The Hidden Life of Trees,” which examines the relationships between trees in the forest he manages in Germany. The trees are always talking, he says, speculating freely about what they are saying. Tree communications include warning neighbors about threats. When giraffes start nibbling at the leaves of African acacia trees, the acacias not only produce a tannin that can sicken large herbivores, they emit a scent that causes acacia trees downwind to produce the same poison. Old Duncan, a mother tree if ever there was one, appears to be on the receiving end these days, surviving through the nutrients shared by her descendants and neighbors. Western science, rooted in a Darwinian survival-of-the-fittest mindset, long saw the forest as an arena of competition, where trees fight each other for sunlight and water, where every old tree that falls gives younger trees a chance for their place in the sun. The new foresters see the forest as a supportive community of plants. Mother trees send food to young trees starved for sunlight. The shade the larger trees provide slows the young trees’ growth, which makes them stronger. In stable forests, strong trees protect each other from the wind. “They live longest and reproduce most often in a healthy stable forest,” Simard told Smithsonian Magazine. “That’s why they’ve evolved to help their neighbors. Some scientists scoff at the tree-hugger sentimentality that has grown around the new research. Trees communicate in their own fashion, they say, react to and shape their environment, and share an “intelligence,” much like animal packs and insect colonies. But they don’t have emotions, will, or intentions. When we hug them, they don’t hug back. Maybe so. As I walk through the rainforest, I can’t hear the conversations of the trees, let alone translate them. We speak the language of humans, not trees, which is why we must use human metaphors – raising children, sounding alarms – that ends up making trees seem human. Whatever I hear, and feel, in the rainforest makes me think such comparisons aren’t fair to the trees.